1. Introduce yourself: Contact the teacher and introduce yourself. Let your child’s teacher know of any concerns or specific goals you have for your child. Opening up this line of communication tells the teacher that you are a team player and you support the happenings in the classroom. 2. Program School Numbers & Emails: At the beginning of the year, program school numbers and e-mails into your phone. That way, if you are out and about or at work, you have the number or email address readily available to you. Don’t forget to program the nurse’s number in as well. You may receive a call from this number if your child becomes ill.
3. Updated Information: Make sure your child’s school has all your current information. If you or a person on your emergency contact list changes numbers, your school needs to know. Also, keep all immunization and doctor information up to date. Therefore, if a medical emergency happens, the school will have the information they need. 4. Absence: Always let your child’s school know about an absence. In our day of age, children need to be accounted for at all times. The reality is, that things can happen on the way to school. So, report your child’s absence and keep the school in the loop. 5. Class Websites: Check class websites and/or newsletters each week for latest information on what is going on in the classroom. Support your child’s learning at school by discussing or practicing skills being taught at school. 6. Lunch Money: Keeping up with lunch accounts can be a big job. See if your school district offers a website or app to make managing lunch money easier. Some apps and websites let you track spending, as well as add money to an account. 7. Daily Communication: If you are looking for daily communication from your child’s teacher, try a communication notebook. Supply a small notebook for you to ask questions or add comments in. Place it in your child’s backpack. Then, the teacher can answer your questions or add comments about your child’s day. The visual reminder of a notebook might be easier than trying to email the teacher each day. But, don’t forget to discuss this system with your child’s teacher first to see if it would be a good fit. 8. Golden Rule: Treat other how you would like to be treated. Sometimes things don’t always go smoothly. But, just remember that you and your child’s teacher are a team. Work together by communicating respectfully and try to produce a solution that best benefits your child. Now you are ready to gear up for back to school night with some good tips in hand! 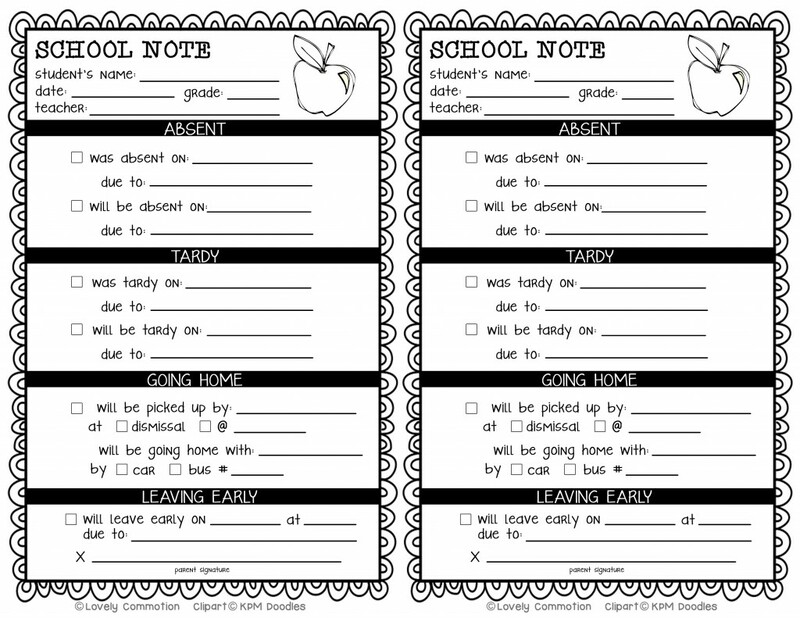 To make communication with school even easier, download these two free printable school notes. 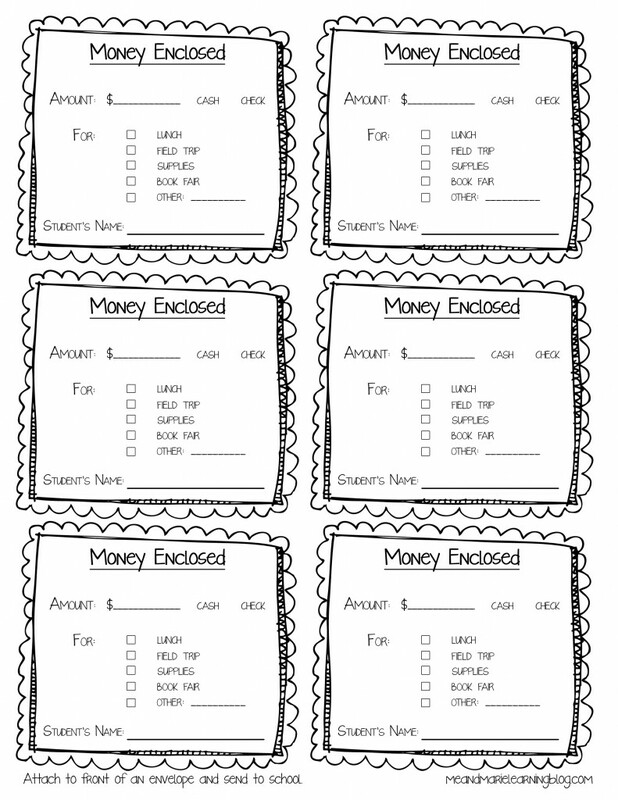 One for lunch money (just staple to the front of an envelope filled with lunch money) and the other for absences or change in pick-up. Happy back to school! About the Author: Ashley Rives is the author of the “Lovely Commotion,” a blog full of fun and information for parents, grandparents & educators. Ashley is a former first grade teacher with a degree in Elementary Education and Early Childhood Education, as well as a Master’s Degree in Reading & Literacy.